The role of dispersion in understanding organic chemistry, both structure and reactivity, is truly coming into prominence (see for example this blog post for a compound whose stability is the result of dispersion). This has been driven in part by new computational techniques to properly account for dispersion. 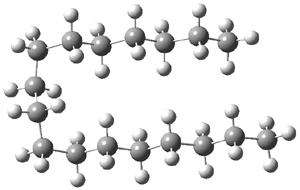 An interesting recent example is the structure of long chain alkanes, with a question posed and answered by Mata and Suhm:1 What is the largest alkane whose most stable conformation is the extended chain? The question is attacked by computation and experiment. The computational methodology involves corrections to the local MP2-F12 energy involving the separation of orbital pairs that are treated with a coupled clusters method. The straight chain (having only anti arrangements about the C-C bonds) and the hairpin conformer (having three gauche arrangements) were completely optimized. The C17H36 hairpin isomer is shown in Figure 1. For chains with 16 or fewer carbons, the all-anti straight chain is lower in energy, but for chains with 17 or more carbon atoms, the hairpin is lower in energy. Gas-phase low temperature IR and Raman spectra suggest that dominance of the hairpin occurs when the chain has 18 carbons, though careful analysis suggests that this is likely an upper bound. At least tentatively the answer to the question is that heptadecane is likely the longest alkane with a straight chain, but further lower temperature experiments are needed to see if the C16 chain might fold as well. Figure 1. Optimized geometry of the hairpin conformation of heptadecane. (1) Lüttschwager, N. O. B.; Wassermann, T. N.; Mata, R. A.; Suhm, M. A. "The Last Globally Stable Extended Alkane," Angew. Chem. Int. Ed. 2012, ASAP, DOI: 10.1002/anie.201202894. I have computed the NCI (non-covalent interactions) surface for C17 (re-optimised from your coordinates using a dispersion-corrected ωB97XD/6-311G(d,p) procedure. It can be viewed here. The surface was generated from an electron density cube (created using e.g. cubgen from a Gaussian checkpoint file) which was submitted here to generate a compressed jvxl isosurface file suitable for viewing using Jmol. The NCI surface is very good at revealing attractive non-covalent regions (the colour code is blue=highly attractive, green = weakly attractive, yellow = weakly repulsive, red = strongly repulsive). It is very good at teasing out hydrogen bonds, and also what might be called the van der Waals dispersion attractions.